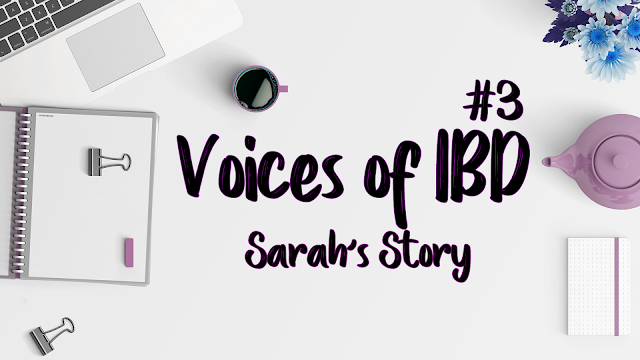 Becx Blogs: Voices of IBD (3) - Sarah's Story. 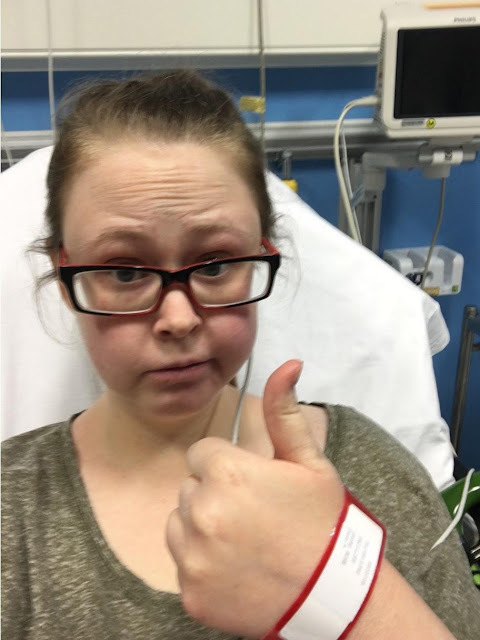 Welcome to PART 3 of the Inflammatory Bowel Disease series, where we talk to people from all walks of life with this condition; to give everyone a platform to share their story, and help to raise awareness. This week we talk to Sarah about her battle with Crohn's Disease. I’m too ill to work, unfortunately but I am currently doing a degree with Open University. I was diagnosed when I was 18 however, I believe I have had Crohn’s all my life. I started with stomach cramping and diarrhoea when I was 14, which tied in with the loss of my Nan who was my rock. I thought nothing of it though, it wasn’t something I wanted to discuss with people and I just assumed it happened to everyone. At 15 I came out in a horrible blistery rash all over my body (which I now know was Erythema Nodosum and quite common with IBD). I was tested over a period of two years for multiple diseases related to the rash and eventually when I was 17 I started to suffer with facial swelling and thanks to a locum GP I was diagnosed with oral Crohn’s disease and subsequently intestinal Crohn’s. It was strange, I was obviously relieved that I had a diagnosis and that it wasn’t just in my head but also I was devastated because I realised that I would never be the same person again and I knew it would affect me for the rest of my life. Not much support at all if I’m honest, at first family and friends tried their best to be supportive but I felt like they didn’t fully understand how I felt as most people thought it was just like having a tummy bug and once it was over I’d be fine and they didn’t quite understand how I was still so tired when my flare ups were over. After a while, once they realised it isn’t like a stomach bug at all, my family were brilliant and have supported me through everything since. As for my friends, that is a different story…some of them still contact me every now and then but I haven’t been out with an actual friend for years. I couldn’t go out drinking all night, I couldn’t go for meals, I couldn’t even go to the cinema without ruining it for everybody. I was always in pain and always exhausted and I had to cancel plans all the time and slowly each friend faded into the background and got on with their own lives. I have infusions of Vedolizumab (Entyvio) every 8 weeks. I’ve had mixed experiences with hospitals, since diagnosis I have had around 10 admissions so I would count myself as one of the luckier ones. My local hospitals weren’t all that great with regards to my Crohn’s care in the beginning so I ended up referring myself to Guys’ and St Thomas’ in London as they have a duel clinic for oral and intestinal Crohn’s. It is a pain to travel back and forth to London but the standard of care I have received from them is fantastic. I have a consultant in London who is my main Dr and then a local consultant who oversees my hospital admissions and treatment. Stress is my main trigger, I was in remission for 18 months until June 2016. The last year has honestly been the worst year of my life and has really affected my IBD. It all started when my mom was diagnosed with brain cancer, she was told she had 6 months to live and my world fell apart but I wanted to stay strong for my dad and brothers (thankfully she is still here today and the cancer has gone). In April 2016, just a few months after my mom’s diagnosis my dad almost died from sepsis, thankfully he is all well and good now but as soon as I had recovered mentally and physically from that my dog of 8 years began to decline and sadly passed away. She was my best friend, my rock and my saviour through diagnosis and dealing with my illness. This was the final straw it tore me apart and I ended up having the worst flare I have ever had, I was losing a lot of blood, 30+ toilet trips per day, agonising pain, bowel incontinence and I couldn’t eat. I lost 8 stone in weight. In 2013 I was diagnosed with depression and anxiety officially. I believe I have always had anxiety, I was always the kid who worried what if our car crashes on the way to the supermarket. I have suffered with depression since the death of my nan when I was 14. It was an empty time of my life, I constantly felt alone and I was also being bullied at the same time. It was hard to deal with, I couldn’t cope. I seem to be better than I was, but still I never feel whole. Was this because of your IBD, or influenced by your IBD, or vice versa? I was suffering with depression for around two years or so before my IBD symptoms really started to interfere with my life. After being diagnosed with IBD I didn’t feel much, it was the realisation that I had lost the person I was before, I had lost my friends and that life would always have this hold over me that really kicked my depression off again. Even now, 7 years later I feel like there is so much I miss out on day-to-day. My family support me as much as they can but I can’t expect too much from them as they all have their own battles going on. My boyfriend is brilliant and he helps me a lot mentally, I honestly don’t know how I would’ve coped with the last few years without him. Professionally, I was prescribed Pregabalin which didn’t help much and made me feel out of it. I was also referred for group counselling which made me feel even more anxious and uncomfortable so I didn’t go. At this time in my life, I think I have a good support net from my family but I honestly think I would benefit from having somebody to talk to. I’m afraid to make the jump into counselling though. Netflix! Lots and lots of Netflix! Hot water bottles are amazing also! I also have a connective tissue disorder which causes my joints to spontaneously dislocate so I am in pain 24/7, which means unfortunately there isn’t a lot I can do. My favourite thing at the minute though is getting my duvet on the sofa, hot water bottle and cuddles with my border collie. I have cut out all meat, except chicken. I rarely eat vegetables or fruit as they are a particularly bad trigger for me. I pretty much only eat chicken, potatoes and gravy at the minute because I know it is safe and won’t cause me much pain. Keep a diary! Make a note of how many times you go to the loo each day and what it was like and whether there was blood and mucus. Make a note of all food and drink you consume and whether any caused pain, bloating and/or the need to go to the loo. Be patient. We don’t mean to be unreliable and cancel plans. We don’t mean to be snappy when we are in pain. IBD is hard to describe, sometimes it is difficult to know what caused our pain and where the pain is coming from. We want you to help us but we aren’t entirely sure what we want you to do. Just be patient with us, give us a hug, a text, a visit, anything just to let us know you are there if we need you. Sometimes IBD can be a lonely place and it is hard to ask for help, don’t always wait for us to ask for help. Hope that one day there will be a cure. I know it sounds corny but we have suspicions that my niece may have belly problems too and it breaks my heart to think she may have to go through what I have been through. "I am in great pain, please help me"
I love it because it means that when I am with people who don’t understand I can have a little self-pity moment and nobody knows what I’m on about. You can find Sarah over on her Facebook page.